Harnessing the power of philanthropy to advance your work. Fundraising Smart strategies to move the needle. Communications Fundraising messaging that inspires. Executive Search Guidance as you find your next standout leader. Strategic Information Services Your data, harnessed for good. Illuminating the brightest ideas in philanthropy and talent management. Read Blogs: practical advice, trending topics, and more. Dive Deeper Original research and detailed how-to guides. Watch Webinar recordings and other video content. Attend Upcoming events and webinars. Learn On-demand training for nonprofit professionals. Collaborating and innovating since 1976. Team Meet our team of passionate professionals. Careers Join the Campbell & Company team. Contact Get in touch with us today. In the fall of 2017, our team members Aggie Sweeney and Kate Roosevelt co-authored a list of 10 campaign best practices. These time-tested recommendations represent the wisdom of four decades of service to the Northwest region. Since then, we’ve recorded a series of six podcasts with leaders from Northwest organizations that exemplified these best practices in their current or recent breakthrough campaigns. Each conversation reveals successes, pain points, and practical advice. Our third episode in the series features Kate Roosevelt speaking with Executive Director Jason Paulsen and Associate Director Sarah Brooks of the Methow Conservancy. Kate Roosevelt: For those of you who may not know the Methow Conservancy, they are the leading conservation organization in North Central Washington. 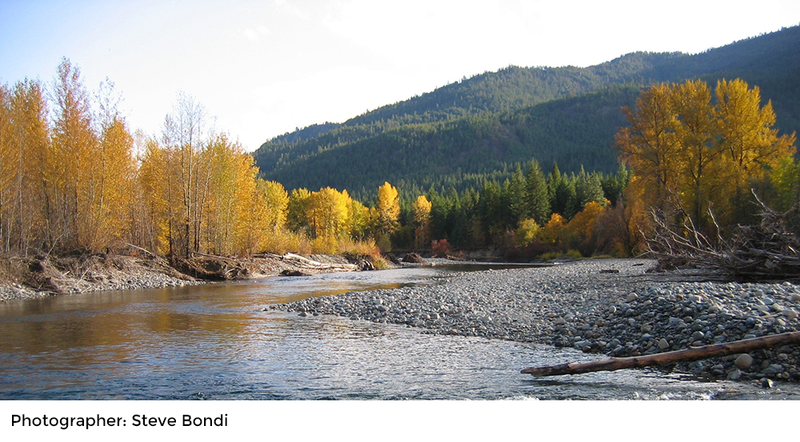 Today, we’ll be exploring campaign best practices, discussing the Methow Conservancy’s capital campaign from the late 2000s. What was the biggest success of your campaign and why? 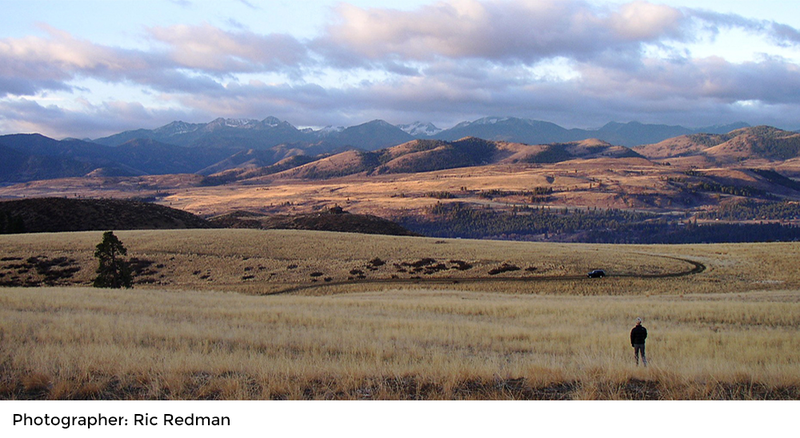 Sarah Brooks: In the late 2000s, we launched our Imagine the Methow campaign, which was a $20 million effort to raise public and private funds to protect some of the best remaining wildlife, habitat, and agricultural grounds in the Methow Valley. It was a bold, ambitious, and never-tried-before effort in our community. We approached it with trepidation but also a belief that the mission was worth overcoming any anxiety we had. Since we are a small, rural community that is also home to a large number of second homeowners from the Seattle area, we knew everyone had to feel like they had a voice in the campaign. I think the greatest success we had was finding a way for every donor of every gift level to feel like they owned a part of the total success. We had folks giving six-figure gifts, a kid who brought us all of the egg money he raised that week, and a ranching family that came into our office and offered us a cow. Kate: What a great story of community-inspired fundraising. What was a particularly challenging moment in the campaign and what was the lesson learned? Jason Paulsen: There is one moment that stands out in particular. We were on our way over to Seattle for a major donor event on the day in September 2008 when the stock market took its 777-point drop. As we were driving down I-5, commentators were chronicling this large drop and what it meant for the world and the economy of our country. We retooled that night, changed our messaging on the fly, and bought ourselves the time to huddle with our campaign team the next day. That began a process of looking internally and externally and trying to figure out: Do we shelf this effort? Do we reduce our goal? How do we change our metrics of success going forward? At the end of the day, we pulled back to our vision, what we had articulated as the reason and need for the campaign, and none of that had changed. Our campaign leadership and team felt we could still hit our original goal, but we would just have to do it more creatively, and it may take a little bit more time. As we look back on it, we probably have more great stories to tell from our campaign because of that challenge. Kate: Building on that, the theme of your campaign was Imagine the Methow. Many different people in your community could find a way to be a part of what you were trying to create. What has been the campaign’s lasting impact on the Methow Valley community and perhaps even beyond? Jason: We embarked on the campaign for a very specific purpose—to protect priority lands on our landscape, critical habitats, and critical agricultural land. We did all that. But I think the lasting impact was that because we are a rural community, we are a community that didn’t have a lot of experience with large capital campaigns. Frankly, to say the words “$20 million” out loud in our community was hard to do. Our community lived through that campaign with us, and other nonprofit organizations have come to see that if they’re bold, if they take the time to articulate a vision, they can do great things for their missions as well. We certainly in every way we can share what we learned with those organizations when they ask for our help. As a community, we came to see that if you do fundraising work well, if you engage volunteers successfully, and if you are diligent, you can achieve your goal. Sarah: The fact that our campaign was called Imagine the Methow—somewhere hidden in there is this belief that a rural community can have a say in what its future is. I don’t think we realized at the moment of the campaign that it was sending that same message beyond land conservation. I definitely see every day in the Valley a much greater sense of “if there is a problem, let’s stand together and address it.” That always existed but the extra step of “now we are confident enough to try it” is a pretty neat outcome. We can’t take full credit for that, but we were really willing to put our organization out there. It opened the door and paved the way for others to be bold, too. Kate: What best practices do you think other organizations should implement sooner rather than later when they are thinking about a campaign? Sarah: I think any best practice that has to do with people is where you start. Without the right people— on your staff, board, and your volunteer crew—it will fall flat. 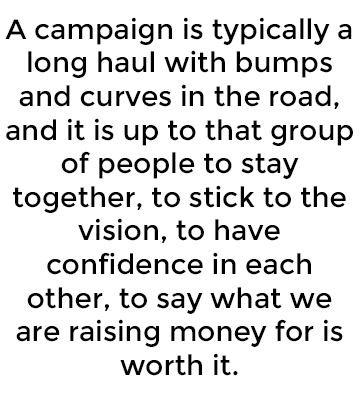 A campaign is typically a long haul with bumps and curves in the road, and it is up to that group of people to stay together, to stick to the vision, to have confidence in each other, to say what we are raising money for is worth it. Kate: In a campaign vision, how do you involve and appeal to people with different perspectives? How did that come together, and what lessons can we learn from that? Jason: Like so many things in local community work, it starts with being willing to do a lot of listening. We started this process by engaging our community, asking them about their vision for the future of our Valley. What did they hope for their children and grandchildren? What did they see as the obstacles or threats to that vision coming to be? What role did they think we, as an organization, could or should play in achieving that vision? And you learn an awful lot when you engage them in those questions and then honestly listen to their feedback. 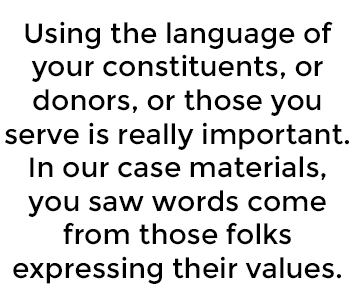 Using the language of your constituents, or donors, or those you serve is really important. In our case materials, you saw words come from those folks expressing their values. When we did any audio recordings or video work, we included local citizens, and we didn’t script them. That gave a real sense of authenticity to the vision. If you were in the community being exposed to that messaging, you could relate to it really well, and you trusted the voices that were delivering it. Sarah: One of the big discussions we had for a long time was, “Is this going to be a campaign that is stopping something negative from happening or moving toward a positive vision of what it could be?” We could feel in all the conversations we had with people that there was a huge sense of pride. It quickly became clear that our vision and case statement needed to focus on good things we can make possible rather than the bad things we can avoid. That may not be true in every campaign situation, but by listening, we quickly gathered the tone of the community and where their sense of joy and optimism came from, so we knew how to match that tone. Kate: What strategies did you use to engage volunteers and tap into their passion throughout the campaign? 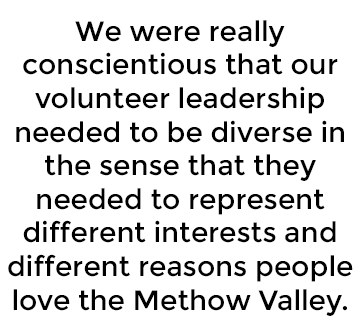 Sarah: We were really conscientious that our volunteer leadership needed to be diverse in the sense that they needed to represent different interests and different reasons people love the Methow Valley. It wouldn’t fly in our community if only the wealthiest members were the leadership. It had to be owned by everyone. We picked a couple and then two individuals to be our campaign leaders who represented very different pockets of interests, who were equally committed to the campaign in terms of their passion for it but at different giving levels. They were able to speak to different audiences in very powerful ways and more importantly, the community saw them form a real friendship over the time of the campaign. It really made a difference and then allowed us to continue to bring in other volunteers who represented all these different viewpoints. Jason: There is nothing more important than engaging that right group of volunteers and leadership and then building opportunities into every facet of the campaign for interested volunteers to plug in to do their part. That is a powerful moment to have a large group of very different people start to talk about each other as “we.” I think a really important piece that we did was to make it a very safe place to share their honest feedback. It was an okay place to say, “that was really hard, what do you say when someone asks you that question?” That vulnerability that they shared with each other is how they formed their bond and friendship. That created this space where every meeting was a chance to celebrate and support each other. Molly Saks is a Senior Marketing Associate and Online Fundraising Consultant at Campbell & Company. She works with all the firm’s service areas to drive thought leadership strategy and helps organizations increase their impact through online fundraising. Join over 10,000 nonprofit professionals who receive frequent fundraising and staff management tips. Subscribe today.